As we already know there has been a struggle with ratings for Season 2 of Basketball Wives LA. Due to recent beef between Laura Govan and newcomer ‘Bambi’, the shows viewership increased passed 2 million for the latest episode, and EGL has the scoop! In season 1’s premier of BBWLA Laura and Malaysia Pargo, had a confrontation that ultimately resulted in a physical dispute. 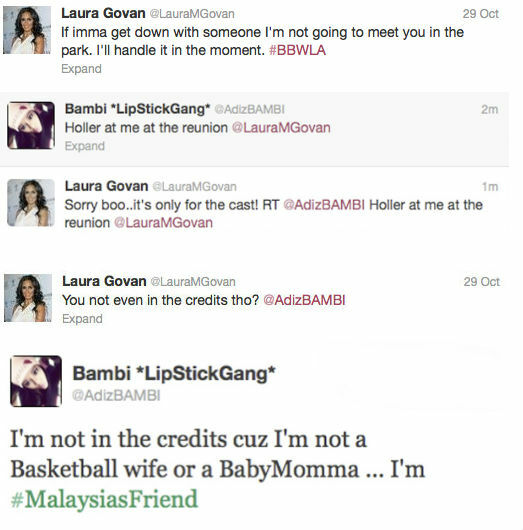 Though their beef has been long squashed since the premier of Season 1, Malaysia’s friend Bambi reluctantly formed an artificial friendship with Laura. In the latest episode, Laura invited Bambi to meet her at a park with hopes that the two could hash things out and squash the tension. Unfortunately, the ladies did not get anything accomplished. Though they did not swing on one another, Bambi’s perception of Laura’s ‘fake-behavior’ did not change. It looks as though Season 2’s reunion is going to be a WWF smack down if the two [should I say 3?] refuse to mend their issues before hand. Do you think that it’s only right that Malaysia involves herself between Laura and Bambi’s beef?